One's alive, the other's a Real Flower Jewelry piece. Several attendees at the Hilo Orchid Show in August this year were drawn to one small table by a very different display. It was mine - a collection of 25 hybrid orchid flowers attached to a dried tree branch, each of which was obviously of a different color, some even with stripes! With them was posted a challenge: to identify which flower had characteristics unlike any other on that branch. From a drawing of only the correct entries, a winner would be selected and then invited to choose from a catalog of my own pieces as a thank you gift for participating and entering the spirit of the challenge. I was surprised at just how many people submitting responses, failed to recognize from a many branched arrangement of those colorful orchids, that only one orchid had its natural lavender color and was fresh picked & not preserved, whereas every other flower in that arrangement had an enhanced or false color, some in gold and copper and silver or were preserved. It was an eye catching and pretty display eliciting numerous entries describing particular flowers as unique for every reason but the right one. I have taken this as a compliment that my preserved flowers looked so fresh and alive that the only real, fresh-cut, live flower was so hard to differentiate! 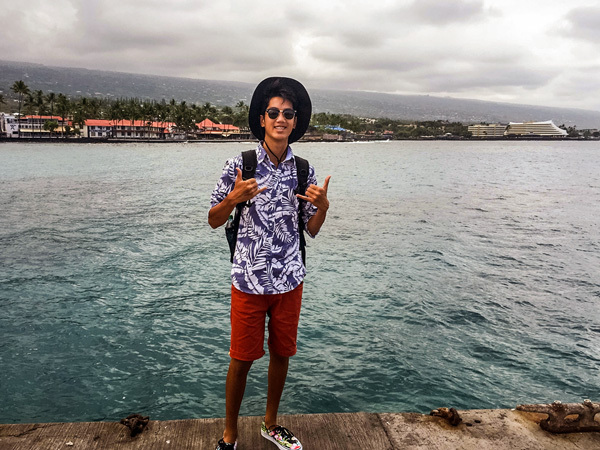 The winner in this particular competition was a young visitor from Texas named Andy Nguyen, visiting family in Hilo only for a short period of time. His prize is any one of my pressed wild flower or Limu items. I await his decision of his favorite piece or will it be his mother’s or girlfriend's selection? Thank you Andy and all the other contestants for entering the fun. Congratulations to the always observant Andy Nguyen! *UPDATE: Andy chose the Limu Oval Locket for his mother. Another correct decision from a sharp, young man.